Enjoy a unique experience by staying in our yurt on a quiet alpaca ranch. Never been in a yurt? It is a tent-like circular fabric structure with a wood lattice frame. Our yurt has comfortable furnishings such as a queen bed with linens, a propane free standing stove, electric lighting, 32' flat screen HD tv, fully equipped kitchen (including oven, microwave, refrigerator, plates, pots, etc) and a bathroom with a shower. The floors are polished pine wood with french doors that open to a deck with meadow and forested views. Leave your worries at home as this is a place to come and unwind (cell service is spotty in this area, generally at&t works). Stroll through the meadow to greet our alpacas and have a picinic next to the creek. Near hiking, lakes, restaurants, quaint downtown, and historic gold mines. Separate bathroom from living space. This yurt is located in a beautiful forest area on an alpaca ranch. enough space for two cars. basic spices (salt/pepper), sugar, creamer, ground coffee. Let me just say I’m super picky about where I stay and this yurt was perfect in every way. Hosts are wonderful and make you feel right at home even offering homemade goodies and fresh ground coffee. We were able to meet the alpacas and give them some treats, so cute. The yurt is cozy and exceptionally clean! It is stocked with what you need for a really nice overnight. We had a great stay and will be back again soon. yurt was cute, clean and cozy, with wonderfl hosts. The yurt was simple and sweet, minimalist but with all the essentials. Nice quiet cozy retreat in a beautiful area. Bed was super comfortable as well. The host left us with makings for coffee and also a fresh baked treat. Short drive into town offered shops restaurants and a yummy cocktail lounge. The Yurt was perfect for a quiet interlude alone to enjoy nature, and the added treat of the Alpacas! The owner was welcoming, warm and friendly. Although the yurt is on the homeowner's property, it was very private. There's something about the surroundings that is "magical", and healing to the soul. When I make my annual trip to CA to visit my mom-in-law sans husband, I like to spend a couple days and nights exploring small towns on my own before I visit family. Finding a place that’s secluded but safe can be a concern for a woman traveling by herself. This place is perfect. Jeanette is a great host, and if you don’t mind wet alpaca sneezes in your face, the critters are fun to hang around with! Very cozy and peaceful. I’d definitely go back. Great accommodations in a beautiful setting! 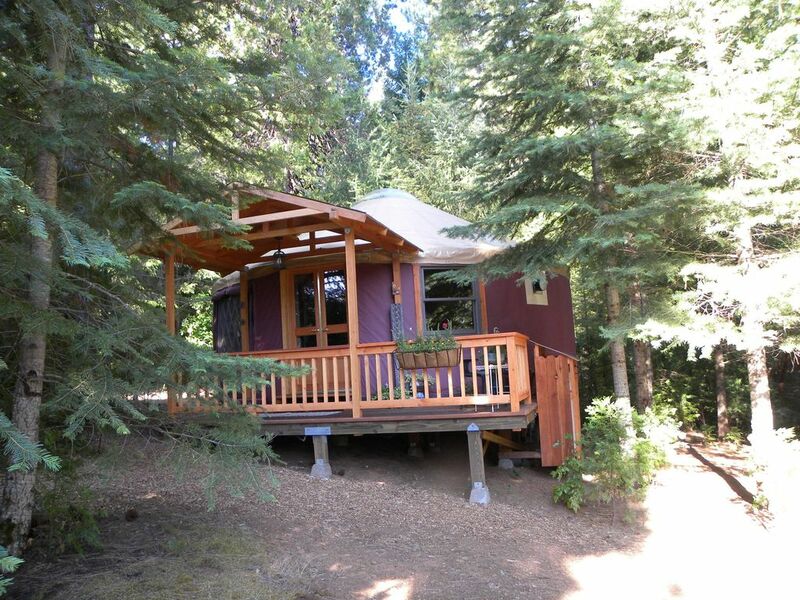 Nestled in the trees, this yurt is a wonderful place to stay, with delightful owners. I will definitely stay there again when I am in the area. No suggestions for improvements! The hosting couple are what makes this stay so wonderful. Yes, the yurt is nestled in a very peaceful setting and yet is just off the main artery. And it is beautifully designed. But the star attractions are the hosting couple who went out of their way to take care of whatever we needed, down to lending me a phone charger. A really relaxing getaway!